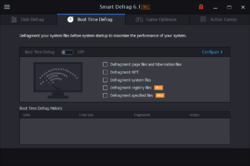 Smart Defrag Pro 6.1.0 was available as a giveaway on November 22, 2018! How would you improve Smart Defrag Pro 6.1.0? ... otherwise, the software works just fine in free mode.
. [ RW ], Enjoy the free version of IObit Smart Defrag, web search for: download iobit smart defrag All the "pro" version added was: -- "pro" [ DMA Direct Memory Access ] speeds up defragging on computers that could benefit from turning on that "pro" feature", if you have an older computer that can toggle DMA, then just go away during defrag ( overnight ? ), and it won't matter to you if it takes a little longer without DMA, -- "pro" [ Auto defrag ], so instead, defrag when you want to, or create a task schedule, -- "pro" [ Auto update ], update minor versions manually if you care, and update or upgrade major versions after 6 months because, hey, it's always free, ... otherwise, the software works just fine in free mode. . This is the defragmenter that I use. I have it set to run automatically, which keeps my drive defragmented without my input. I like the GUI because it is large and good for my poor vision. I'm not a guru, but this seems to do a good job. I notice my computers are more responsive the day after I ran IObit Smart Defrag the night before, not so using free MyDefrag or other defraggers. I do not care about boot speed, so I wait for IObit's pre-boot defrag feature ( and all other boot-defrag features from Piriform, O&O, Auslogics, DiskKeeper, and so on -- I'm away making my breakfast, so who cares how long a computer takes to boot? ). 1 - All IObit software except it's anti malware work almost completely fully and fine in free mode, and revert to free mode when the "pro" license expires, the "pro" license only turns on some additional features, such as auto update, but may also turn on other nice tool benefits, so, check each IObit software for features that show a [ Pro] logo next to a feature, in IObit Smart Defrag, "pro" [ DMA Direct Memory Access ] speeds up defragging on computers that could benefit from turning on that "pro" feature", and "pro" [ Auto defrag ], and "pro" [ Auto update ], otherwise, the software works just fine in free mode. 2 - All IObit software can be reinstalled anytime, including older versions, and the older license my work if it has not expired, and can be updated within minor versions, but don't expect licenses to migrate across major version updates, and especially across major version upgrades. 3 - Newer IObit software version my inherit older version licenses, but not directly accept older licenses, so if you have a working license for an older version, re-install the older version and license it first, then upgrade to the new version and see if it inherits the older version's license. 4 - All IObit software run something in the background or in scheduled tasks that ( a ) helps the program and ( b ) teases you to buy something ... and all of these background installations can be turned off using a variety of free tools, such as free Microsoft Sysinternals AutoRuns. 5 - NOT a problem here, but IObit registry cleaning tools can cause a computer to not reboot, so be careful, be aware, backup and create restore points, and only remove things from the registry that you fully understand, line by line, why, and are prepared to take full responsibility for. 6 - I have never had a malware infection inside or leak or increased spam or invasions or phishing due to IObit software.
. I notice my computers are more responsive the day after I ran IObit Smart Defrag the night before, not so using free MyDefrag or other defraggers. I do not care about boot speed, so I wait for IObit's pre-boot defrag feature ( and all other boot-defrag features from Piriform, O&O, Auslogics, DiskKeeper, and so on -- I'm away making my breakfast, so who cares how long a computer takes to boot? ). Notes about IObit software: 1 - All IObit software except it's anti malware work almost completely fully and fine in free mode, and revert to free mode when the "pro" license expires, the "pro" license only turns on some additional features, such as auto update, but may also turn on other nice tool benefits, so, check each IObit software for features that show a [ Pro] logo next to a feature, in IObit Smart Defrag, "pro" [ DMA Direct Memory Access ] speeds up defragging on computers that could benefit from turning on that "pro" feature", and "pro" [ Auto defrag ], and "pro" [ Auto update ], otherwise, the software works just fine in free mode. 2 - All IObit software can be reinstalled anytime, including older versions, and the older license my work if it has not expired, and can be updated within minor versions, but don't expect licenses to migrate across major version updates, and especially across major version upgrades. 3 - Newer IObit software version my inherit older version licenses, but not directly accept older licenses, so if you have a working license for an older version, re-install the older version and license it first, then upgrade to the new version and see if it inherits the older version's license. 4 - All IObit software run something in the background or in scheduled tasks that ( a ) helps the program and ( b ) teases you to buy something ... and all of these background installations can be turned off using a variety of free tools, such as free Microsoft Sysinternals AutoRuns. 5 - NOT a problem here, but IObit registry cleaning tools can cause a computer to not reboot, so be careful, be aware, backup and create restore points, and only remove things from the registry that you fully understand, line by line, why, and are prepared to take full responsibility for. 6 - I have never had a malware infection inside or leak or increased spam or invasions or phishing due to IObit software. .
Let me rephrase #5 to say: "boot" not "reboot"
5 - NOT a problem here, but IObit registry cleaning tools can cause a computer to not boot, so be careful, be aware, backup and create restore points, and only remove things from the registry that you fully understand, line by line, why, and are prepared to take full responsibility for. What I mean is, your computer may work fine after messing with the registry, and you not know something is damaged until you try to reboot. I didn't mean to imply that some damage with the registry prevents a computer from ever turning off and or every allowing or trying to reboot.
. Let me rephrase #5 to say: "boot" not "reboot" 5 - NOT a problem here, but IObit registry cleaning tools can cause a computer to not boot, so be careful, be aware, backup and create restore points, and only remove things from the registry that you fully understand, line by line, why, and are prepared to take full responsibility for. What I mean is, your computer may work fine after messing with the registry, and you not know something is damaged until you try to reboot. I didn't mean to imply that some damage with the registry prevents a computer from ever turning off and or every allowing or trying to reboot. .
What would you say is your advantage over free solutions such as the built in, or Defraggler? What would you say is your advantage over free solutions such as the built in, or Defraggler? Thanks. This IS a free solution. And this defrags pre-boot and deletes temp and other unnecessary files to speed up defragging and subsequent file access. I find my system most responsive after running IObit Smart Defrag, more responsive than any other defragger.
. [ AR ], This IS a free solution. And this defrags pre-boot and deletes temp and other unnecessary files to speed up defragging and subsequent file access. I find my system most responsive after running IObit Smart Defrag, more responsive than any other defragger. .
AR, The built in "optimise drives" in Win 10 does not have automatic ssd "Trim" enabled and must be turned on. I have found Windows doesn't do the best in defrag of a drive or "trim" the ssd. I've tested it and another right after, and on second run, their tool actually increased the ssd speed hence Win 10 "optimise", I concluded, did not do best job. I have never used Defraggler but would welcome a review of it. I have used CCleaner paid edition (uninstalled after their fiasco), iObit Advanced System Care (turned off notifications in it) but like Ashampoo WIN Optimizer 2018. I would have installed and tried this, but I like running a software "tryout" at least a year. AR, The built in "optimise drives" in Win 10 does not have automatic ssd "Trim" enabled and must be turned on. I have found Windows doesn't do the best in defrag of a drive or "trim" the ssd. I've tested it and another right after, and on second run, their tool actually increased the ssd speed hence Win 10 "optimise", I concluded, did not do best job. I have never used Defraggler but would welcome a review of it. I have used CCleaner paid edition (uninstalled after their fiasco), iObit Advanced System Care (turned off notifications in it) but like Ashampoo WIN Optimizer 2018. I would have installed and tried this, but I like running a software "tryout" at least a year. DJ, Just to add, my iObit Advanced System Care was from long ago and is now uninstalled. My wanting to download this edition of Smart Defrag was to see if any changes made to it different from that in A.S.C. . I'm actually glad I did not after reading Marshell's #11 comment. That is why I uninstalled A.S.C. but see they are still up to doing it. All IObit software ( except it's anti malware ) work almost completely fully, and fine, in free mode, and revert to free mode when the "pro" license expires -- the software never expires, only the "pro" features expire. The "pro" license only turns on some additional features, such as auto update, but may also turn on other nice tool benefits, so, check each IObit software for features that show a [ Pro ] logo next to a feature. And, for me, it leaves my computer more responsive than any other defragger.
. [ DJ ], This is NOT a 6 month trial, it is "forever" software that never expires ... except for 3 features, read on ... All IObit software ( except it's anti malware ) work almost completely fully, and fine, in free mode, and revert to free mode when the "pro" license expires -- the software never expires, only the "pro" features expire. The "pro" license only turns on some additional features, such as auto update, but may also turn on other nice tool benefits, so, check each IObit software for features that show a [ Pro ] logo next to a feature. In IObit Smart Defrag, see -- "pro" [ DMA Direct Memory Access ] speeds up defragging on computers that could benefit from turning on that "pro" feature", if you have an older computer that can toggle DMA, then just go away during defrag ( overnight ? ), and it won't matter to you if it takes a little longer without DMA, -- "pro" [ Auto defrag ], so instead, defrag when you want to, or create a task schedule, -- "pro" [ Auto update ], update minor versions manually if you care, and update or upgrade major versions after 6 months because, hey, it's always free, ... otherwise, the software works just fine in free mode. And, for me, it leaves my computer more responsive than any other defragger. .
Peter Blaise, It IS a 6 month trial due to the fact I do not get to try everything AFTER 6 month PRO license expires! Hence, the edition being shown here IS a 6 month trial. Yes there is a free edition that it reverts to AND yes I can read. When I want to test a software, I'd like to be able to do it for a year, to both give it an honest shot, and to compare with other resources. Peter Blaise, It IS a 6 month trial due to the fact I do not get to try everything AFTER 6 month PRO license expires! Hence, the edition being shown here IS a 6 month trial. Yes there is a free edition that it reverts to AND yes I can read. When I want to test a software, I'd like to be able to do it for a year, to both give it an honest shot, and to compare with other resources. I'm glad it works for you. Which of those do you think you need or want or will use at all, let alone cannot asses within 6 months?
. 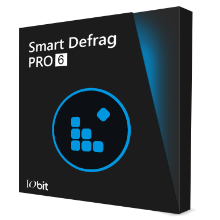 [ DJ ], Here are the "pro" features of IObit Smart Defrag: -- "pro" [ DMA Direct Memory Access ] speeds up defragging on computers that could benefit from turning on that "pro" feature", if you have an older computer that can toggle DMA, then just go away during defrag ( overnight ? ), and it won't matter to you if it takes a little longer without DMA, -- "pro" [ Auto defrag ], so instead, defrag when you want to, or create a task schedule, -- "pro" [ Auto update ], update minor versions manually if you care, and update or upgrade major versions after 6 months because, hey, it's always free, ... otherwise, the software works just fine in free mode. Which of those do you think you need or want or will use at all, let alone cannot asses within 6 months? Just askin'. . I have always liked iobit, however, I am kind of disappointed in them lately. I own System Care Pro and it did not want to work with my computer ( Win 10 pro 64-bit version 1803). I had to uninstall it completely because every time I rebooted my computer I had to go in and re-install it and then go find my activation code etc.! That being said, since it's been a while, I decided to try this. It installed very quickly. It was easy to set up. I ran it and it only took like 5 minutes tops to defrag my c drive, my g drive, and my recovery image drive. The problem is I unchecked everything BUT my c drive, and it re-checked the other two. After a fight, it listened long enough to defrag my c drive. It does an outstanding job. As soon as I clicked on chrome it popped open and loaded FAST. I have been using just windows defrag ( open it and run it myself). My computer was getting slower and slower, not loading like it should and costing me time. I love this program, but I'm not keeping it. The reason? Well as I was using it, it downloaded System Care Pro! I had to go in and uninstall it. I have to fight it from putting things I do not want on my computer, I have to fight it to do what I want...not worth my time. I am truly sorry but I'm done with them until they stop these things. I have always liked iobit, however, I am kind of disappointed in them lately. I own System Care Pro and it did not want to work with my computer ( Win 10 pro 64-bit version 1803). I had to uninstall it completely because every time I rebooted my computer I had to go in and re-install it and then go find my activation code etc.! That being said, since it's been a while, I decided to try this. It installed very quickly. It was easy to set up. I ran it and it only took like 5 minutes tops to defrag my c drive, my g drive, and my recovery image drive. The problem is I unchecked everything BUT my c drive, and it re-checked the other two. After a fight, it listened long enough to defrag my c drive. It does an outstanding job. As soon as I clicked on chrome it popped open and loaded FAST. I have been using just windows defrag ( open it and run it myself). My computer was getting slower and slower, not loading like it should and costing me time. I love this program, but I'm not keeping it. The reason? Well as I was using it, it downloaded System Care Pro! I had to go in and uninstall it. I have to fight it from putting things I do not want on my computer, I have to fight it to do what I want...not worth my time. I am truly sorry but I'm done with them until they stop these things. Marshell Wooley, that's the point I was making earlier today. My problems were with Advance System Care too. iObit doesn't seem to understand this is my computer, not theirs! You do what I want, not the other way around. I learn one thing from you,,, they still "Doesn't Play Well Others." Marshell Wooley, Thanks for the warning. I suggest you email IObit with your problem as they are good at solving problems. They had fixed my problems. Marshell Wooley, I suggest you email IObit with your problem as they are good at solving problems. They had fixed my problems. I wonder if YOU accepted installing IObit Advanced System Care when you accepted the installation options for IObit Smart Defrag, or within IObit Defrag > Action Center. Try beginning the reinstallation of IObit Smart Defrag again to see where you might have accepted the additional installation of IObit Advanced System Care, and read each screen carefully before clicking through, and or check the Action Center in the program and see where you can accept installation of supplemental software. In my experience, IObit "hides" other software installations in black-on-black low-contrast options during installation, but other than accepting such screens without scrutinizing them, I haven't found that any IObit software installs other software automatically without your express permission and acceptance. I wonder if your prior installation of IObit System Care that seemed to disappear whenever you rebooted was accidentally and unintentionally installed in a sandbox / virtual machine. If IObit Smart Defrag survives rebooting and is there, then reinstall IObit Advanced System Care again, but make sure it's not in a sandbox.
. [ Marshell Wooley ], I wonder if YOU accepted installing IObit Advanced System Care when you accepted the installation options for IObit Smart Defrag, or within IObit Defrag > Action Center. Try beginning the reinstallation of IObit Smart Defrag again to see where you might have accepted the additional installation of IObit Advanced System Care, and read each screen carefully before clicking through, and or check the Action Center in the program and see where you can accept installation of supplemental software. In my experience, IObit "hides" other software installations in black-on-black low-contrast options during installation, but other than accepting such screens without scrutinizing them, I haven't found that any IObit software installs other software automatically without your express permission and acceptance. __________ I wonder if your prior installation of IObit System Care that seemed to disappear whenever you rebooted was accidentally and unintentionally installed in a sandbox / virtual machine. If IObit Smart Defrag survives rebooting and is there, then reinstall IObit Advanced System Care again, but make sure it's not in a sandbox. . The sad part is I DID email back and forth several times. I just got tired of it all. Brian, The sad part is I DID email back and forth several times. I just got tired of it all. I was very careful while installing because I know of their practices. But it could have been in my backup files. Peter Blaise, I was very careful while installing because I know of their practices. But it could have been in my backup files. 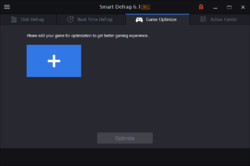 You can try the IObit Smart Defrag installation again and see if IObit Advanced System Care is there or not ( it is not in my version of the IObit Smart Defrag installer ). Regardless, IObit Advanced System Care is harmless and can be turned manual by turning off auto and schedule background tasks, or uninstalling it. My laugh at IObit is when any of their programs updates each other, then when you run that newly updated IObit program, the program itself says it's got yet another update available -- as if there is no one clearinghouse for IObit current distributions. Yeah, I'm complaining about free stuff -- geesh!
. 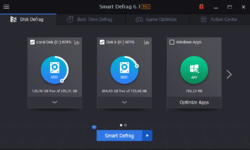 [ Marshell Wooley ], You can try the IObit Smart Defrag installation again and see if IObit Advanced System Care is there or not ( it is not in my version of the IObit Smart Defrag installer ). Regardless, IObit Advanced System Care is harmless and can be turned manual by turning off auto and schedule background tasks, or uninstalling it. My laugh at IObit is when any of their programs updates each other, then when you run that newly updated IObit program, the program itself says it's got yet another update available -- as if there is no one clearinghouse for IObit current distributions. =8^o Yeah, I'm complaining about free stuff -- geesh! ; - ) . jj juice, That is from the time of windows 98.
jj juice, I found it an amusing trip back in time. C'mon fellow BDJ fans, lighten up on this guy. I think what the intent here was to show a geek's equivalent to the continuous video feed of a fireplace from one of the cable TV shopping channels that is (or used to be) broadcast on holidays when they aren't selling stuff if I recall correctly. Fortunately, all my "C" drives are now SSDs so no need to use this app on them. Can anyone point me to an article that explains, to a former technical person, how SSD memory works? How they load, store and retrieve data? I started working with computers in 1974, I know how the read/write heads of rotating hard drives work, and why the smaller the physical drive, the faster they are able to read and write, with more storage space in the drives. But since I retired, I haven't found anything that explains how SSD drives work. Thank you for your help! Manolo's Tech, Thank you! That was just what I needed. :) I am using a 250gb SSD from Crucial as my primary HD, and a 7200 rpm Seagate as my secondary HD. Smart Defrag works well, but for many users the standard Windows Defrag will be adequate, as it runs automatically and works very well. Starting with Windows Vista, Microsoft's own defrag software automatically defrags your hard drive once a week. In some cases, using third party defrag software will lead to better disk performance than using Windows Defrag. But, sometimes they will actually reduce performance. If you want software with more options than Windows Defrag, it's worth trying today's giveaway. But, for the average user, I'd recommend sticking with Microsoft's own defrag software. As I already mentioned, it runs automatically once a week, so unless you feel the need to do a defrag on an external hard drive, you'll probably never need to run it manually. The following test of defragmenters, shows just how well the standard Windows defrag works. The article is a little dated and the performance of the defrag software tested, has hopefully improved over time as new versions has been released. But it does show how well Microsoft's defrag software works. If you are using a SSD rather than a hard drive, Smart Defrag won't defrag it. It will just issue a TRIM command to clean up the drive. Whenever defrag software is discussed, there will always be people claiming that it is unsafe to defrag SSDs, but this is simply not true. It is perfectly safe to defrag a SSD. Because of the way SSDs work it is pointless to defrag them, as fragmentation does not slow them down the way it does on traditional hard drives. However because SSDs have a very long life span, defragging them won't kill them. The following article from data recovery company Ontrack, is just one of many articles that proves that SSDs can last for a very long time. In theory, a brand name SSD, should last much longer than a hard drive. ( b ) delete temporary and other unnecessary files first before defragging, thereby speeding up the defrag process, and speeding up all file-access activitied thereafter. Microsoft does no such thing.
. [ Roger ], IObit Smart Defrag offers to automatically ( a ) defrag files during pre-boot that Windows cannot otherwise defrag, and ( b ) delete temporary and other unnecessary files first before defragging, thereby speeding up the defrag process, and speeding up all file-access activitied thereafter. Microsoft does no such thing. .
Additional software is useless on Windows 10nas Windows takes care of this on a weekly base. Also, fragmentation slows down disk but not SSDs. Additional software is useless on Windows 10nas Windows takes care of this on a weekly base. Also, fragmentation slows down disk but not SSDs. Review THIS software, not just the "philosophy of defragging" in general.
. [ JJ Vastiau ], Review THIS software, not just the "philosophy of defragging" in general. IObit Smart Defrag offers to automatically ( a ) defrag files during pre-boot that Windows cannot otherwise defrag, and ( b ) delete temporary and other unnecessary files first before defragging, thereby speeding up the defrag process, and speeding up all file-access activitied thereafter. Microsoft does no such thing. .
JJ Vastiau, it's now always useless. For the average user, Windows Defrag will be find, but some people want to have more control over defragging and sometimes third party defrag software will increase disk performance more than Windows Defrag will. A regular question. What happens after six months? Zen , Re "What happens after six months?" This program does not store documents you need to access after six months. I guess it will become a free version, meaning you will lose some of its features. That is all. As they give away this program about once per six months(*) for a period of six months, I do not care. The supplier gets more exposure this way than with a permanent licence. (*) It was given away on 30-11-2017 and 27-5-2018. Zen , Re "What happens after six months?" Why should you care? This program does not store documents you need to access after six months. I guess it will become a free version, meaning you will lose some of its features. That is all. As they give away this program about once per six months(*) for a period of six months, I do not care. The supplier gets more exposure this way than with a permanent licence. (*) It was given away on 30-11-2017 and 27-5-2018. All IObit software except it's anti malware work almost completely fully and fine in free mode, and revert to free mode when the "pro" license expires. The "pro" license only turns on some additional features, such as auto update, but may also turn on other nice tool benefits, so, check each IObit software for features that show a [ Pro] logo next to a feature. otherwise, the software works just fine in free mode, which it will revert to after the "pro" license expires.
. [ Zen ], Try it and see: All IObit software except it's anti malware work almost completely fully and fine in free mode, and revert to free mode when the "pro" license expires. The "pro" license only turns on some additional features, such as auto update, but may also turn on other nice tool benefits, so, check each IObit software for features that show a [ Pro] logo next to a feature. In IObit Smart Defrag, -- "pro" [ DMA Direct Memory Access ] speeds up defragging on computers that could benefit from turning on that "pro" feature", -- and "pro" [ Auto defrag ], -- and "pro" [ Auto update ], otherwise, the software works just fine in free mode, which it will revert to after the "pro" license expires. .
Zen , if will revert to the free version which has less features. Here is a list of differences between the free and paid versions. 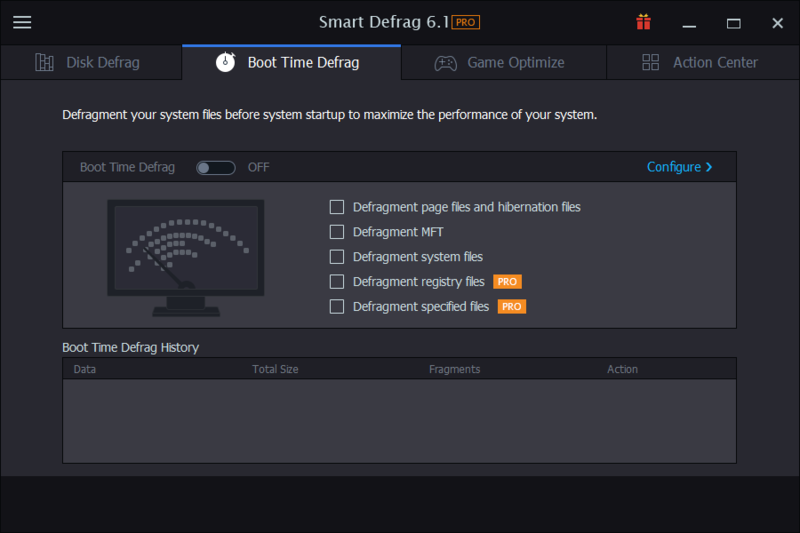 Smart Defrag is regularly available as a giveaway. If you keep an eye on the various giveaway sites, you will be be able to get another giveaway license before the six months is up. Zen , if will revert to the free version which has less features. Here is a list of differences between the free and paid versions. https://www.iobit.com/en/compare/sd/ Smart Defrag is regularly available as a giveaway. If you keep an eye on the various giveaway sites, you will be be able to get another giveaway license before the six months is up. In the past here on GOTD, I've told my story about iOrbit till, even I'm sick of hearing about it. That said, I believe and trust nothing they say or offer! Maybe they've cleaned up their act and now knows how to, "play well with others". I don't know if that's true. I won't give them a chance to find out. A few years ago their reputation was at 0%. Besides, a 6 month license is it really worth it? Sounds more like a test drive for you to buy it! You can guess, I'm not taking the bait for Smart Defrag. Thanks to GOTD for all your other giveaways. Whatever your bad experience was, if you don't share it, we can't help you remedy it. I have no problem with IObit software ( I don't use their anti malware software ). ... all companies nag, it's part of marketing. Quit complaining and take advantage of free stuff. Or complain and don't take advantage of free stuff.
. [ Jim C ], Whatever your bad experience was, if you don't share it, we can't help you remedy it. I have no problem with IObit software ( I don't use their anti malware software ). I am aware of IObit's auto install of nagware, which I simply eliminate using free Microsoft SysInternals AutoRuns ... which also let's me turn off nagware from Adobe, Java, Microsoft, HP, Dell, Apple, Intel, IObit is not exceptional and is is "good" company, so to speak ... ... all companies nag, it's part of marketing. Quit complaining and take advantage of free stuff. Or complain and don't take advantage of free stuff. Your choice. . I do not believe anything anymore from IObit. Defrag for an SSD is not recommended. Window itself optimizes an SSD. Windows still has Defrag but automatically you end up on the Optimalisation Tool. I do not believe anything anymore from IObit. Defrag for an SSD is not recommended. Window itself optimizes an SSD. Windows still has Defrag but automatically you end up on the Optimalisation Tool. Ivanovich, Smart Defrag does not defrag SSDs, it just will issue a TRIM command. Roger, and that is "Optimalisation"! Ivanovich, I never said it is. I just explained that Smart Defrag goes not defrag SSDs. I do not believe anything anymore from Ivanovich. "Defrag" for an SSD automatically calls a "trim" command from an aware operating system to inform a solid-state drive which blocks of data are no longer considered in use and can be wiped internally. Window itself "optimizes" nothing, because "optimise" is not a technical term for any specific thing. And neither is "Optimalisation Tool" -- "Инструмент оптимализации" ? I do not believe anything anymore from Ivanovich. "Defrag" for an SSD automatically calls a "trim" command from an aware operating system to inform a solid-state drive which blocks of data are no longer considered in use and can be wiped internally. Window itself "optimizes" nothing, because "optimise" is not a technical term for any specific thing. And neither is "Optimalisation Tool" -- "Инструмент оптимализации" ? . Zen , In the Dutch language, Windows calls this "optimalisatie". There is no mention of trim function. Ivanovich, I am sure that in Chinese it is something different again. The comments are in English, you claimed that something was a wrong word, and yourself used a wrong word. That is all. #1, Dutch "optimalisatie" = English "optimization" according to Google translate ( not "optimalisation" ). #2, "optimize" means absolutely nothing, technically, but the ad-hoc self-applied meaning of any programmer or marketer who uses the term, it is technically meaningless. #3, This is IObit software, not Microsoft software, so Microsoft's programming and marketing terms do not apply. #4, when this page says "... Smart Defrag 6 can not only defragment users' HDD but also trim SSD ..." they explicitly are NOT saying that they "defrag SSD", they ARE saying -- read it again -- "defragment ... HDD" and "trim SSD" -- see that -- "trim SSD".
. [ Ivanovich ], #1, Dutch "optimalisatie" = English "optimization" according to Google translate ( not "optimalisation" ). #2, "optimize" means absolutely nothing, technically, but the ad-hoc self-applied meaning of any programmer or marketer who uses the term, it is technically meaningless. #3, This is IObit software, not Microsoft software, so Microsoft's programming and marketing terms do not apply. #4, when this page says "... Smart Defrag 6 can not only defragment users' HDD but also trim SSD ..." they explicitly are NOT saying that they "defrag SSD", they ARE saying -- read it again -- "defragment ... HDD" and "trim SSD" -- see that -- "trim SSD". #5, a simple and easy web or library search for "trim SSD" brings an industry-standard definition of "trim SSD": Trim Computing A trim command allows an operating system to inform a solid-state drive which blocks of data are no longer considered in use and can be wiped internally. Trim was introduced soon after SSDs were introduced. Wikipedia You're welcome. .
Zen , I did not use a wrong word. I am even provided a link to a respected tech site to prove it. If you Google ssd trim, you will find thousands more. Zen , I did not use a wrong word. I am even provided a link to a respected tech site to prove it. Here's another link. digitalcitizen.life/simple-questions-what-trim-ssds-why-it-useful If you Google ssd trim, you will find thousands more. Safe, stable and easy-to-use it may be, but it’s not necessary. Modern systems automatically take care of their own defragmentation, while too much of it can wear down the drive. Furthermore, SSDs should not be defragmented. Please review THIS software, not just the "philosophy of defragging" in general. All defrag action taken on an SSD become "trim" commands to inform a solid-state drive which blocks of data are no longer considered in use and can be wiped internally. Aside: think of the old adage that injuries increased when wearing helmets ... because deaths decreased and survival increased, including survival with injuries. Drives wear themselves out by constantly hunting for fragmented parts of files and therefore become more reliable by appropriate defragging. Also, computers become more responsive when defragged, and so, a user will keep the computer longer, thereby making the drive last longer, rather then replace the whole computer because it's running too slow. Don't confuse yourself with inappropriate misunderstanding of actual facts.
. [ tomcat ], Oy. Please review THIS software, not just the "philosophy of defragging" in general. IObit Smart Defrag offers to automatically ( a ) defrag files during pre-boot that Windows cannot otherwise defrag, and ( b ) delete temporary and other unnecessary files first before defragging, thereby speeding up the defrag process, and speeding up all file-access activitied thereafter. Microsoft does no such thing. All defrag action taken on an SSD become "trim" commands to inform a solid-state drive which blocks of data are no longer considered in use and can be wiped internally. __________ Aside: think of the old adage that injuries increased when wearing helmets ... because deaths decreased and survival increased, including survival with injuries. Drives wear themselves out by constantly hunting for fragmented parts of files and therefore become more reliable by appropriate defragging. Also, computers become more responsive when defragged, and so, a user will keep the computer longer, thereby making the drive last longer, rather then replace the whole computer because it's running too slow. Don't confuse yourself with inappropriate misunderstanding of actual facts. .
tomcat, using defrag software a lot should not affect disk life. When you defrag a disk regularly, there will be fewer fragmented files to reorganise than when you defrag less often. Please do share specifics on any defragger who's results slow a computer down. ( b ) delete temporary and other unnecessary files first before defragging, thereby speeding up the defrag process, and speeding up all file-access activities thereafter. Microsoft and "trim" do no such thing.
. [ Roger ], Please do share specifics on any defragger who's results slow a computer down. Also, IObit Smart Defrag offers to automatically ( a ) defrag files during pre-boot that Windows cannot otherwise defrag, and ( b ) delete temporary and other unnecessary files first before defragging, thereby speeding up the defrag process, and speeding up all file-access activities thereafter. Both are benefits to responsiveness during use and recoverability after a crash Microsoft and "trim" do no such thing. .
Peter Blaise, this is a rather old test, but it shows that in some cases, disk performance is worse after running defrag software. It's an old test so the software tested will have got better at defragging since then. However, more importantly, it shows that often disk performance is better when using Windows Defrag rather than a third party defrag tool. Of course, individual results will vary and I have read posts of forums who claim that there computer is faster after running Smart Defrag. I guess the main thing to take from this, is that Windows Defrag works very well and for the average user it will be all they need. People like myself, prefer to use third party software. Peter Blaise, this is a rather old test, but it shows that in some cases, disk performance is worse after running defrag software. It's an old test so the software tested will have got better at defragging since then. However, more importantly, it shows that often disk performance is better when using Windows Defrag rather than a third party defrag tool. hofmannc.de/en/windows-7-defragmenter-test/benchmarks.html Of course, individual results will vary and I have read posts of forums who claim that there computer is faster after running Smart Defrag. I guess the main thing to take from this, is that Windows Defrag works very well and for the average user it will be all they need. People like myself, prefer to use third party software. Sorry, [ Roger ], but that supposed comparison "test" of defraggers is totally bogus, focusing on ONE criteria, namely, speed of loading -- speed of loading Windows, and speed of loading some programs. Defragging also has other goals, namely, recovery after a crash ... and they did not identify the accuracy of data recovery with and without defragging, let alone between different defraggers. They also did not explore options, and worse, they did not not choose options aimed solely for their tests, for example, they let some degraggers load during boot, but not other defraggers, yet they tested boot speed nonetheless. A defragger loading during boot could mean defragging files that Windows cannot defrag, or, alternatively, it could mean queing up automatic defragging to ensure that the user gets continuous benefits of defragging -- which are, a responsive computer AND a recoverable computer after a crash ... they did not say which "boots with Windows" options were selected or not. I can make a computer take hours to boot if I defrag everything that Windows cannot defrag while it is running, but I don't care about waiting because I'm away from the computer, so speed of booting is a choice I make intentionally and aware -- if I'm there, I can tap keys to skip pre-Windows defragging and get a quick boot, if I'm away, it will put my computer files in order for speedy retrieval, not just in daily use, but especially after a crash. So, how long does it take an anti malware scan or a check-disk scan or a data recovery scan or a backup-and-verify program to check all those temp and unnecessary files ... that IObit Smart Defrag deletes before defragging? I know you were only referring to that report to show that Microsoft's own defrag seems equivalent to other defraggers, but they only tested defragging and loading some programs, not long term responsiveness, broad spectrum responsiveness ( including routine anti malware scans ), reliability, and recoverability, they did not explore the features and benefits of the other programs that go beyond "mere" defragging. And YES, the specific names of programs tested are so old as to be misleading. That reference was bad to begin with 5 years ago, and it is worse now.
. Sorry, [ Roger ], but that supposed comparison "test" of defraggers is totally bogus, focusing on ONE criteria, namely, speed of loading -- speed of loading Windows, and speed of loading some programs. Defragging also has other goals, namely, recovery after a crash ... and they did not identify the accuracy of data recovery with and without defragging, let alone between different defraggers. They also did not explore options, and worse, they did not not choose options aimed solely for their tests, for example, they let some degraggers load during boot, but not other defraggers, yet they tested boot speed nonetheless. A defragger loading during boot could mean defragging files that Windows cannot defrag, or, alternatively, it could mean queing up automatic defragging to ensure that the user gets continuous benefits of defragging -- which are, a responsive computer AND a recoverable computer after a crash ... they did not say which "boots with Windows" options were selected or not. I can make a computer take hours to boot if I defrag everything that Windows cannot defrag while it is running, but I don't care about waiting because I'm away from the computer, so speed of booting is a choice I make intentionally and aware -- if I'm there, I can tap keys to skip pre-Windows defragging and get a quick boot, if I'm away, it will put my computer files in order for speedy retrieval, not just in daily use, but especially after a crash. IObit Smart Defrag offers to automatically ( a ) defrag files during pre-boot that Windows cannot otherwise defrag, and ( b ) delete temporary and other unnecessary files first before defragging, thereby speeding up the defrag process, and speeding up all file-access activitied thereafter. So, how long does it take an anti malware scan or a check-disk scan or a data recovery scan or a backup-and-verify program to check all those temp and unnecessary files ... that IObit Smart Defrag deletes before defragging? I know you were only referring to that report to show that Microsoft's own defrag seems equivalent to other defraggers, but they only tested defragging and loading some programs, not long term responsiveness, broad spectrum responsiveness ( including routine anti malware scans ), reliability, and recoverability, they did not explore the features and benefits of the other programs that go beyond "mere" defragging. And YES, the specific names of programs tested are so old as to be misleading. That reference was bad to begin with 5 years ago, and it is worse now. .